What better way to celebrate the Royal Air Force’s 100th birthday? 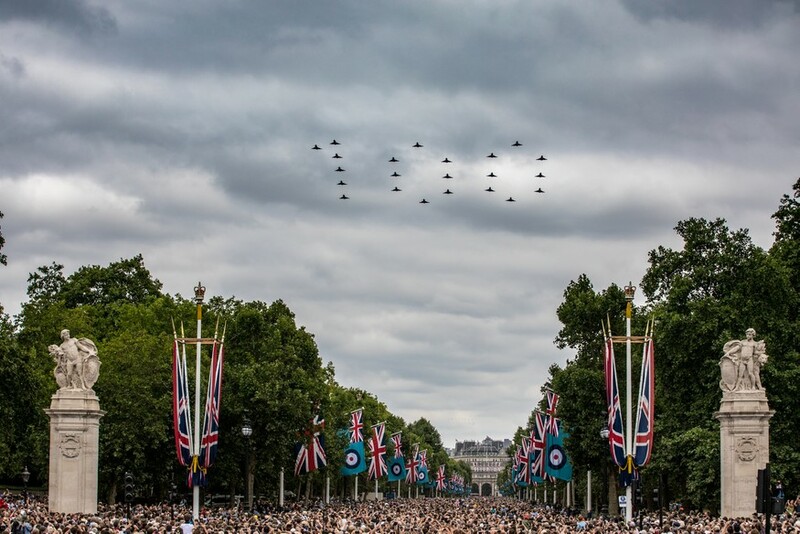 Flying a Typhoon fighter right over Buckingham Palace and the thousands of people lucky enough to be in London to witness this spectacle. I envy those pilots, who took centre stage on the day, while their other colleagues remained inconspicuous to the majority of us. These unsung heroes are on patrol elsewhere; in our own NATO skies, of course, but also as far afield as the Falkland Islands, and perhaps most significantly, in ‘full combat mode’ over Syria and Iraq. It was also a privilege to see the range of other aircraft that took part in the flypast, each one representing a specific and essential component of this broad organization that we’re proud to call our Royal Air Force. My grandfather was in the Royal Flying Corps, the air arm of the British Army before it merged with the Royal Naval Air Service in April 1918 to become the newly-named, much-argued-about, independent Royal Air Force. He would be amazed to see sights like this in London, 100 years later. Perhaps even more poignant is how the Royal Air Force holds huge significance throughout the generations. My mother Mavis (now 93 and yet as sharp as ever!) watched these celebrations on TV, proudly remembering how her own husband Alan served as a pilot in World War II, and that I too served for 34 years in that same light-blue uniform. My grandfather would also remind me of his brother, a Royal Flying Corps pilot who spent more time as a prisoner of war than in the air. And his other brother, who proudly served with the Royal Naval Air Service till the age of 29, when he was tragically killed in April 1918…all these events and people are part of my heritage; all are a part of what determines my inner strength to meet today’s opportunities and challenges. Travelling by train in full military attire on the 10th of July felt as special as any day in my life wearing the Royal Air Force uniform. The extraordinarily positive reaction from fellow travellers was unexpected. Chatting to those around me, reminiscing with fellow ‘veterans’ and feeling the kinship of Service personnel, I laughed when one Sergeant said, “There are way too many officers to salute in this city right now!”. The interest from non-military members of the public was also a pleasure; even when I lost my hat momentarily as yet another youngster decided there was only one way to ensure a decent selfie. This was ‘the Military Family’ on full display. That sense of camaraderie reminded me of why, four years ago, I agreed to join the Board for The Military Mutual, alongside five other trusted former Army and Naval Service professionals, and in cooperation with insurance-industry experts who wanted to do more than pay lip service to the Military Covenant (that essential bond between ‘the people’ and the armed forces). Through our products and services, our focus is protecting the people who protect us now (those in uniform) and in the past (veterans), and the people who provide vital support (including the moral support offered by so many members of the public on the 10th of July). Happy 100th to the Royal Air Force from The Military Mutual.